Twenty taco shops deep into 2010, I revisit my taco roots. 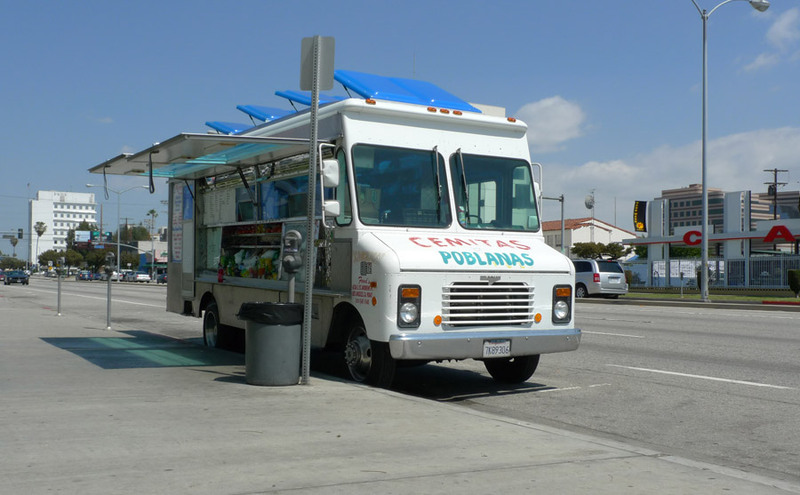 I luncheoned today at Angelica’s, or as my friends call it, “Cemitas Poblanas” or simply “Taco Truck”. This truck specializes in the Puebla-style sandwich known as the cemita, which seems to be their biggest seller, but the tacos are still taken seriously. 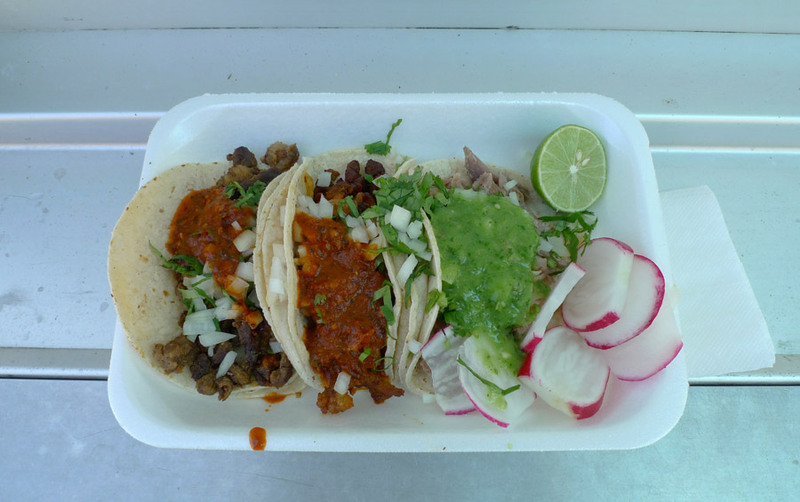 Angelica’s was the first ever taco truck from which I ate, and the first place I discovered the magic of Al Pastor, way back in 2004. Their al pastor is not the best in the city, but it’s still dang delicious, and it remains the benchmark by which I judge all others. Angelica’s parks in front of the Smart & Final on Venice Boulevard in Palms, one of the only trucks regularly parked in this diverse, dingbat-filled neighborhood. Today I ordered three tacos, the carne asada, al pastor, and carnitas. They were $1.25 each, slightly larger than average, and served after just a couple of minutes’ wait. I proceeded logically from left to right, first eating carne asada. This taco was such a normal carne asada taco (and keep in mind that normal=delicious in the case of tacos) that I struggle to comment on it – by the time it had cooled down enough to pick up in the hand, it went by in a flash of light, heat and taste that seems to have wiped my memory clean of all thought and anxiety. Tortillas were the normal type, bilaminated. I did suffer a partial tortilla failure on this first taco, but the others withstood. The salsa is thick, pretty spicy and quite strong. The steak was chopped finely and was very beefy, with good texture and the good kind of buttery fatty flavor. I moved on next to the taco al pastor. It was my favorite. The meat is cut into small pieces, and it’s orange except where it’s been charred to near black, with more textural variation than is typical of al pastor. It’s saucy but also seems a little dry-rubby somehow. The intensity of flavor – a chorizo-like garlic-chile-onion, with salt and citrus pouncing on it – is truly overwhelming, and would be so even without the addition of red salsa on the top. There are plenty of chunks of fat in the meat. Sometimes I find some gristly bits, but not today. It really was a wonderful taco. Al pastor is a funny thing. I know what it’s hypothetically supposed to be – sliced from a revolving spit with a slice of pineapple sitting on top – but most of the time, I don’t know where it comes from or how they have made it. It’s different every time. I don’t have the vocabulary or the power of discernment to analyze the competing flavors, and I can’t define it in such a way that all examples would be covered. I will not be the author of the Unified Field Theory of Al Pastor. All I can do is taste it and humbly appreciate its stage presence, its tall, dark and brooding good looks and winning charisma. The carnitas taco was third in the lineup. I enjoyed it, but the meat is not remarkable – it’s the grey carnitas of uniform texture and moist stringy tenderness that you find when carnitas is not a specialty. The green salsa was more extraordinary, being a very potent salsa verde, spicy and intensely cilantro-centered. It reminded me of the aji verde I enjoy at Peruvian restaurants. Venice blvd never looked more beautiful.